This week was supposed to be a Kumbaya moment for state legislators and ridesharing services. On Wednesday, Gov. Jerry Brown signed it into law compromise legislation allowing the firms to continue to flourish, while requiring them to increase their insurance coverage. But just before then, the California Public Utilities crashed its regulations into the ridesharing services’ carpool operations, such as Lyft Line and Uber Pool. Carpooling via smartphone app has become a key element of the services’ strategies for competitiveness and growth. Uber’s carpooling service offers rates some 40 percent lower than UberX, its most affordable regular option. In response, the ridesharing companies vented their frustration with the state’s legal hurdles. 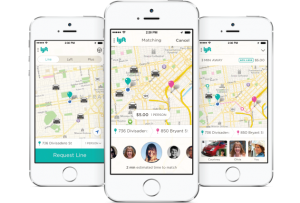 Lyft championed its Lyft Line carpool as contributing to “carbon reduction and improved air quality,” high priorities for many state and city officials. 1. A Passenger State Corporation, or PSC. Rogowsky explains: “[I]t can charge people individually for a shared vehicle. This is how SuperShuttle can drive around to multiple neighborhoods, pick people up and drop them all at the airport without running afoul of the law. None of the services indicated it had any plans to shut down or suspend carpool features. Despite tooth-and-nail competition among the three, all have chosen in effect to call the CPUC’s bluff. As of yet, there is no indication the CPUC has created concrete plans to ensure their interpretation of the law is enforced — shifting attention back to lawmakers in Sacramento. But the regulatory assault comes after the compromise worked out in the Legislature. Rather than ramming new regulations down the throats of the app-driven companies, lawmakers struck a deal that left all sides content, if only for the moment. The CPUC’s action reminded everyone that not just legislators elected by the people, but unelected bureaucrats, hold clout in the Golden State.